Kilt Accessories There is 1 product. 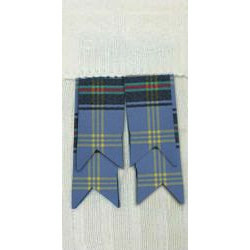 Garter flashes is fabric which hangs from the outside of your socks/hose in matching tartan to your kilt. They are attached to elastic which fastens with a hook and clasp under the cuff of your socks/hose. These garter flashes are doubled meaning they have 2 pieces of fabric (flash) per garter.